At Teamgate we’ve heard a lot of myths regarding CRMs and the art of selling. The longer we’re in this business the more we notice how these myths seem to grow and proliferate. And when it comes to selling, we’ve learned that myths can damage your business, very seriously. Here’s the background we’ve discovered. Myths – just like diseases – can be contagious. And dangerous, especially to your intelligence. For example: Bats can see. Angry bulls don’t particularly care whether the shirt you’re wearing is green, or red. A vomitorium was not a place where Romans went to be sick. And yes, lighting does strike the same place twice – New York’s Empire State building gets hit over 100 times every year. See what I mean? It’s the same in the world of sales, myths are everywhere. For some reason sales CRM software has spawned a hell of a lot more myths than any other area of the selling process. Is that just because people are afraid of change, and making excuses to avoid that change causes myths to be born? At Teamgate we’re always curious, so let’s take a closer look. Myths surrounding sales CRMs are keeping a lot of smart salespeople rooted in the dark ages, and robbing them of the chance to sell smarter. Some sales professionals have the notion that CRMs are all the same, that they are expensive, that will make life more difficult, that they impinge on personal lives by monitoring employees, and, some doggedly believe that the old ways are still the best ways. If the dark ages are where you want your sales team to be – trapped in mounds of paperwork; keeping track of contacts and meetings in your head; managing endless incomprehensible spreadsheets; and missing vital calls and meetings – by all means listen to those myths. But, if you want to stay at the top of the selling game we’ve compiled a list of some of the myths you should avoid like the plague. No, they are not! CRMs are different – and diverse – for one simple reason; no two companies are the same. With that in mind, there is no one CRM which can fit the needs of every single company. There are as many influencing variables as there are CRMs on the vendor’s shelves; price, features, mobility, in-house, cloud-based, etc. That’s why when setting out on the path to choose a CRM for your business, you really need to understand the problems which you want to resolve. Only then can you choose the right CRM, suited for your exact needs, and capable of resolving your problems. Yeah, sure! And Einstein flunked math… A really top-end CRM like Teamgate – along with many others, are designed with user scalability in mind. Businesses tend to start small, successful ones grow, and really successful ones can even turn into giant corporations, but the CRM employed from day one should be able to handle that growth seamlessly. The idea of choosing a CRM, “because everyone else is using it”, or “because it’s cheap” is a certain path to disaster. To put it simply, choose the CRM solution that’s right for your business, answering all your questions, and able to scale along with your business. OK, so let’s go back to the previous topic for a moment. If your sales process is a holistic one – involving all departments of your business in the sales process – then your CRM is part of that journey for everyone involved in that process. Not just sales, but marketing and customer excellence teams can reap the rewards of really smartly designed CRM software. Every department involved in the sales process need to be closely aligned, with your CRM as the backbone of that alignment. Wash your mouth out with soap! CRM (Customer Relationship Management) is not just software, CRM is the core philosophy behind your whole sales strategy – or at least it should be. The idea behind CRM is the notion that selling alone is no longer good enough, the process should be a journey entered into by the buyer and the seller, and one which offers positive returns and benefits to both parties. The CRM business strategy endeavours to increase sales, at the same time as optimising customer value and satisfaction. The customer has needs and concerns, and the job of your sales team is to listen, identify, and resolve those needs. CRM software, like Teamgate, is an integral part of that CRM philosophy. Think about the process behind riding a bicycle. Complicated right? But somehow, you learned how to do it. 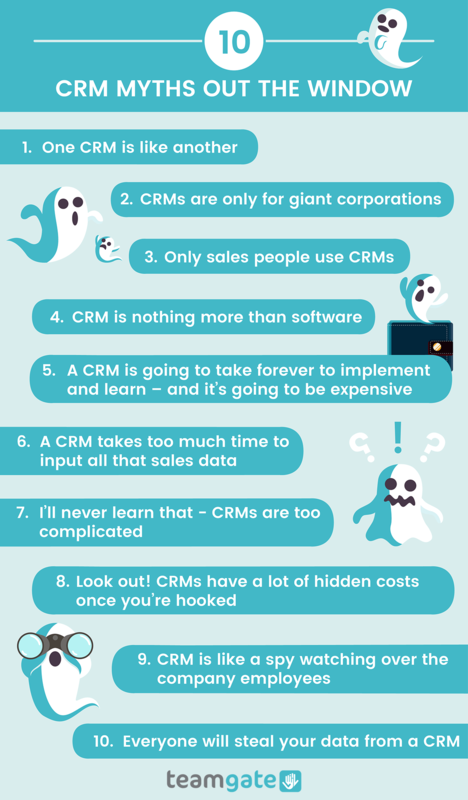 Once again, if you’ve chosen the wrong CRM for your business, this myth might, in fact, be true. A badly designed CRM can have you feeling right out of your league, an in the water way over your head. But if you’ve chosen a CRM like Teamgate let me congratulate you now. Teamgate sales CRM has been awarded – get this – the Number 1 spot on the Capterra Top 20 Most User-Friendly CRM Software Report, two years in a row. Enough said. Let’s make this one short. If you’ve chosen badly – whether it’s a CRM, a hot-dog, or a new car – there may always be hidden costs. So, just make sure you’ve asked all the right questions, from all the right people, and are satisfied with the answers. If you’ve bought your CRM for $5 from a guy in a dark alleyway, there’s a very good chance that your data will be stolen. Good CRM suppliers realise the importance and integrity of your business data and are constantly engaged in maintaining and evolving security features. Teamgate is one such company, with a dedicated team in place ensuring the integrity and security of the lifeblood of your business; your data. With data being stored in multiple highly secure environments, with a consistent uptime of over 99.5%, in the highly unlikely event of a major security incident, your data will be still available from another secure server location. Data backups are performed daily – one or two times – depending on your chosen CRM plan, and all data is backed up for a minimum of one week, meaning total restoration is almost always possible. Teamgate also provides and maintain highly stable and secure connections; firewalls and intruder detection systems; system integrity protection; and performs ever-evolving updates to the operating system. So, myth busted. Your data is safe with Teamgate. No, your new CRM won’t turn your startup business into a global phenomenon overnight – but it will set you on the right path. Make sure you really question why your business needs a CRM, and investigate the problems which you need to resolve. If you know the questions, you’ll find it a lot easier to discover the CRM that’s just right for you. Your CRM software is just a part of an overall business strategy. Make sure that your CRM is fully aligned with that strategy. The most expensive CRM isn’t necessarily the best CRM. And finally, don’t believe everything you hear. If you need advice, ask the experts like Teamgate, a free trial, or online tutorial will help answer all your questions.